Extended – QuoJob. The Agency Software. Test QuoJob without obligation as a demo version! You are expanding with your advertising agency and want to be prepared for the future? 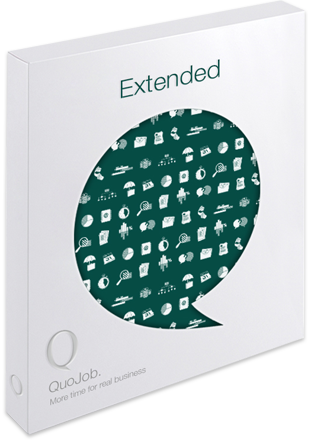 With 26 or more employees, you have achieved the “Enterprise” status for which we recommend our highest product level: the “Extended” edition of QuoJob. This version leaves nothing to be desired and offers almost limitless possibilities for organizing your company in a highly professional and efficient manner. You are fully focused on your day-to-day business and need reliable agency software that networks your employees, transparently reflects administrative processes and supports you automatically in correspondence, sales activities, your complete accounting and human resources? QuoJob Extended provides you with all modules and tools of our web-based software solution. With the central contact database, addresses and information on contact persons are never lost again, you have access to them at any time. Linked to the job module, all projects and all correspondence can be assigned to the respective customer, prospective customer or supplier. The MyTime module provides complete time recording of all work – whether internal processes or job-related. This in turn enables you, as project manager, controller or managing director, to keep track of how profitably projects or agency tasks are implemented on a daily basis. You no longer have to waste valuable time with individual briefings and coordination for project planning. Because that’s what QuoJob does for you: Create a job, delegate tasks to team members, set time limits, brief details, set milestones in the project plan. Since your agency software is flexible in every respect, existing tasks and project plans can be changed at any time. You can see at a glance in the “hours” overview in the job or via the controlling tool how far the calculated time budget is utilized. Numerous business data, surveys, target/actual comparisons and analyses can also be generated here; many of them will be of particular importance for the further development and planned growth of your advertising, media or communications agency. Personnel development plays a special role in planned expansions. The HR module enables you, for example, to manage personnel arrivals and departures, training measures, manage confidential data on social security and personal bank details, and keep applicants’ personal details and status always in view. Where personnel is recruited, sales are also in full swing. Here, too, the best software for advertising and media agencies helps you by using the QuoJob CRM tool (Customer Relationship Management) to control and transparently map all your activities, schedule them with deadlines and link them to specific measures. Last but not least, the selection function in the contacts module supports you, where you can click to select who receives your newsletter or is included in your press release distribution list. Thanks to the web-based software solution QuoJob, you can also use all functions of your agency software outside your office. All you need is an Internet connection. With QuoJob Mobile and QuoJob App you are also connected to your agency software via smartphone. – Always ready for new business! Additional modules / features are individually configured depending on your needs and requirements. A free trial version is already waiting for you! Simply fill out the online form and send it to us. We will contact you immediately and provide you with a demo version of QuoJob “Extended” without obligation. We will also be happy to answer any questions you may have in a personal consultation.